A portfolio of Serendipity Point Films award-winning films. 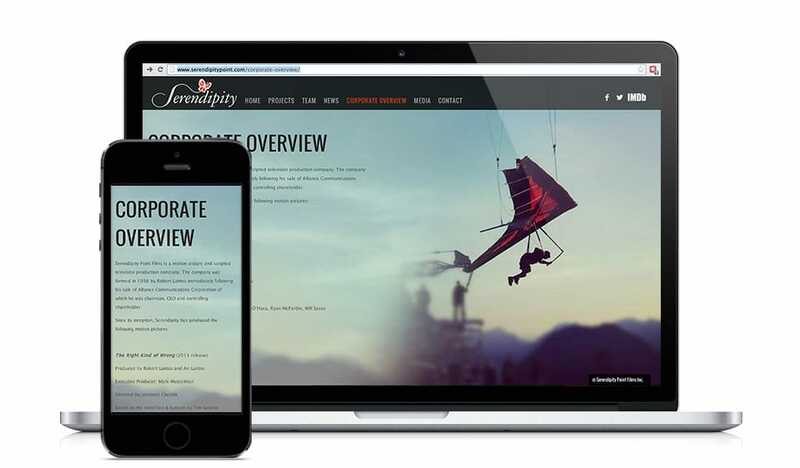 With a Toronto International Film Festival premiere looming and a company website that had been down for months, Serendipity Points Films knew they needed an modern and professional website that was easy to update in order to showcase their award-winning, A-list film and television projects. Information about their latest releases had to be current and easily, yet securely, available to the media. Tactica delivered a high-quality WordPress portfolio site that showcased the films through professional, clean and modern design that allowed the stunning visuals created by world-class cinematographers to shine. A blog was incorporated to enable easy and timely news updates to the site. Publicity information was made available to media through a password protected site. The website was unveiled on the first day of the Toronto International Film Festival and served as a focal point for their latest film premiere, The Right Kind of Wrong (Ryan Kwanten, Sara Canning). Passwords were distributed to authorized media which allowed Serendipity to control and monitor the flow of information and still provided ease of access to publicity materials for media outlets when needed. Serendipity Point Films is an award-winning motion picture and scripted television production company. The company was formed in 1998 by Robert Lantos immediately following his sale of Alliance Communications Corporation of which he was chairman, CEO and controlling shareholder. Since its inception, Serendipity has produced motion pictures including Barney’s Version (Paul Giamatti, Dustin Hoffman), Eastern Promises (Viggo Mortensen, Naomi Watts) and David Cronenberg’s ExistenZ (Jude Law, Jennifer Jason Leigh) and the television series Men With Brooms.